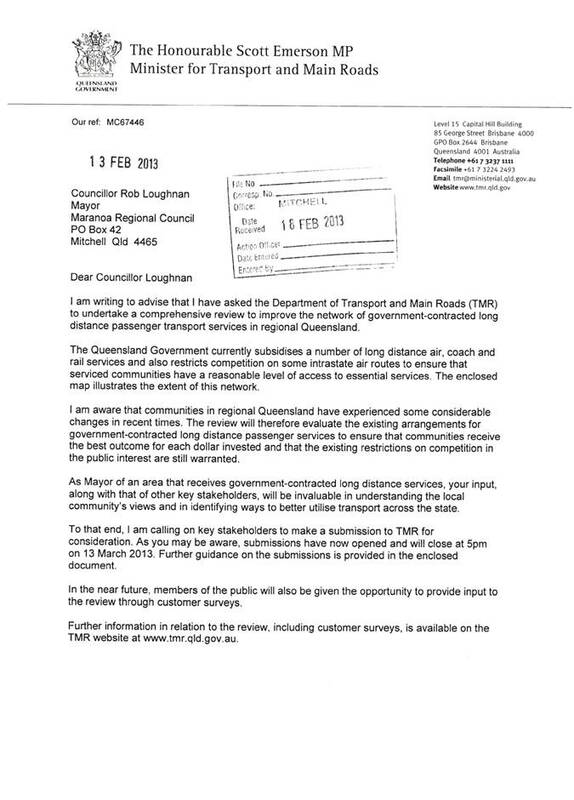 The Department of Transport and Main Roads (DTMR) is undertaking a review of long distance passenger services in regional Queensland. 1 Determine the appropriate role of the state government in facilitating the delivery of services, either through regulation or subsidies. 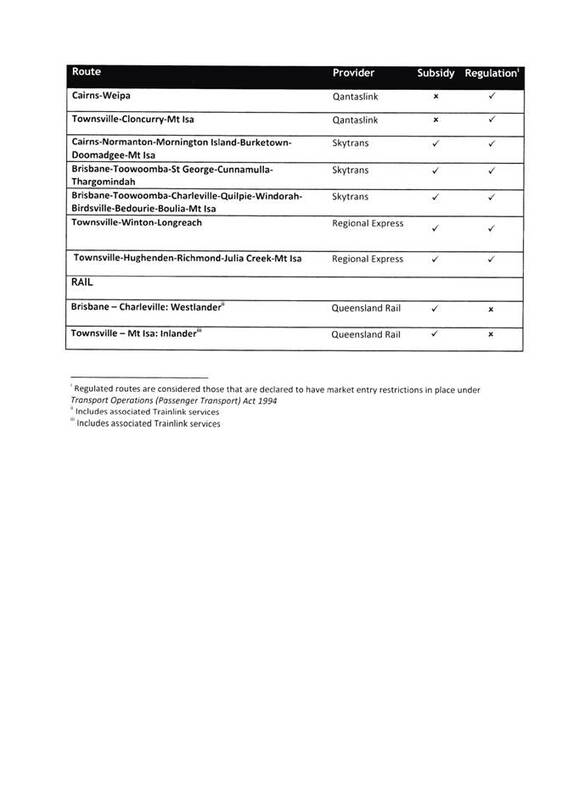 2 Provide recommendations to ensure value for money outcomes for the Queensland Government and the public without restricting commercial, long distance passenger transport markets (for example, deregulation of certain air routes where the market can sustain competition could be considered and may potentially create lower airfares and increase service frequency). 3 Ensure regional communities continue to receive a reasonable level of access to essential services in major centres. 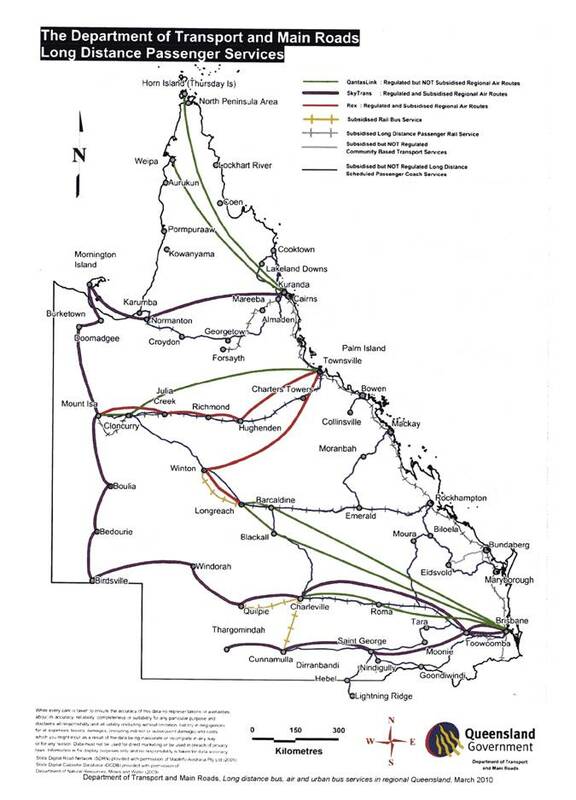 The original purpose of regulating the Roma Brisbane air service route was to ensure the region has adequate access to air travel, historically the Roma Brisbane route did not have a demand that was large enough to be financially viable for aircraft operators. The current Regular Public Transport (RPT) operator Qantas Link is contracted to operate 16 flights per week on the Roma Brisbane route; currently Qantas Link is far exceeding their contract consistently operating 50 flights per week. In addition to the RPT flights Qantas Link and Skytrans are operating regular closed charter flights, meaning the general traveling public is unable to access these services. If the Roma Brisbane route was deregulated Skytrans would have the option to sell fares to the public for flights that they are currently operating. In NSW the figure of 50,000 passengers traveling annually on a route that is regulated triggers a review of the regulated status. Generally the benefits in regulating that route no longer exist when that volume is reached and the benefits of competition become higher in priority. DTMR do not have a nominal figure that triggers a review. It is generally accepted by the aviation industry that an air route that sustains over 100,000 passengers traveling annually can support two or more aircraft operators. In the majority of cases when a second aircraft operator commences the result is a reduction in fares causing an increase in passenger numbers. Given the current passenger forecasts the Roma Brisbane route will be able to sustain multiple aircraft operators now and into the future with the potential result being a reduction in the fare price. Any additional operators wishing to establish RPT flights would need to be done through a process of negotiation with Council - additional facilities are needed and appropriate lease arrangements would mean Council would retain a level of control. The addition of another aircraft operator has the benefit of access to an additional network of airports and the possibility of opening up new services such as a Brisbane – Roma – Longreach – Cairns route or potentially a Brisbane – Roma – Longreach – Mount Isa – Darwin route. Routes such the ones mentioned have many benefits including additional access to international airports increasing tourism to the area and also opening business opportunities that may not exist currently. I believe that we need to look at Roma airport being a link in a chain instead of being a service that dead ends in charleville. If there was a service from Brisbane to Roma to Longreach to Cairns and return, this would open up the interior of the state to new business opportunities and tourism. 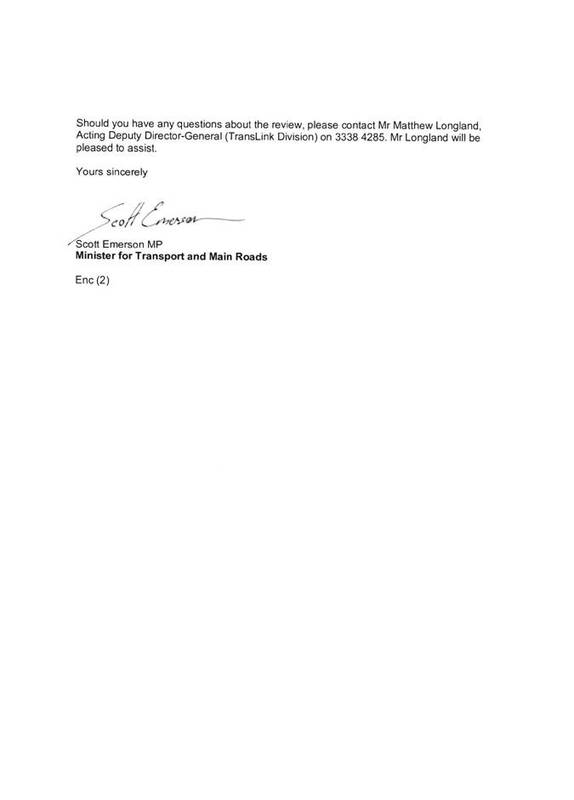 I have spoken with a manager from Anglicare at Roma who said they would use a service from Roma to Longreach as they service out to Longreach and currently drive because it's inconvenient to fly the way you have to go now. I would suggest that government investigate business opportunities and cost savings that linked flights will open up. With the growing Asian tourist market and direct flights into cairns increasing there is a great opportunity here to redirect some of this traffic to the inland tourist communities. Longreach and Roma both have large inland airports and have strong tourism roots. I have heard Longreach is keen to increase the number of tourists passing through the "stock mans hall of fame". Currently international tourists seem to fly into cairns then move south down the coast and end up in Brisbane Sydney or Melbourne. International tourists visiting for 2 weeks holiday don't want to spend most of that time driving out west but flying for an hour and overnighting in a western town for a true outback experience is appealing. This will then offer opportunities for bus tours from Longreach and Roma to other western tourist hot spots. For example a tourist flys into Cairns, visits the reef, then flys to Longreach, visits the Hall of Fame then flys to Roma or takes the option of a bus tour departing Longreach and following the dinasour trail back to Roma, visits the Big Rig Museum or Carnavon Gorge thens flys back to Brisbane. This works well with my proposal to change our airport into a transport hub, with aircraft , undercover bus depot, taxi base, and all the hire car company's based here. And if the state government is so inclined we can add high speed passenger trains as well (the train might be a wish ). This would be a good model for Longreach as well. The other linked flight path I would like investigated is Brisbane, to Roma, to Longreach, to Mount Isa, to Darwin. Again opening up business and tourism opportunities. If the Roma – Brisbane route is deregulated and there is an error in the current passenger forecasts resulting in a dramatic drop in passenger numbers, quality and frequency of available flights a case can be made to DTMR to have the route reregulated. “De-regulating the Brisbane to Roma Airport route will most likely result in additional RPT carriers wishing to start operating into the Roma Airport. The introduction of competition on a route usually has the following benefits. 1. Reduced air fares. Competition will usually result in a reduction in airfares as the carriers compete to retain their load factors. Airfare reduction has flow on benefits to the community not only making air travel more accessible to a broader base of the community, but also making the region more accessible to tourists and business in general. 2. Improved service. The operators will work harder to be the preferred carrier by improving service delivery, including frequency of services, airport facilities where possible, and route development and connections. 3. Choice. Additional carriers offer the consumer choice, in terms of time of travel, and also airline networks, and ultimately destinations. 4. Route Development. The operators have a vested interest in making the route a success. Competing for passengers they will be committed to route and regional development initiatives. This will also include introducing other potential city pair options based on passenger needs e.g. Roma – Gladstone, Roma – Sydney, etc. 5. Connections. Brisbane Airport is the nearest international airport and increased flight options would provide further opportunities to connect internationally. De-regulation of the Roma to Brisbane route would provide further options from heavy road, bus and rail usage for agriculture, tourism and energy industries. “Aviation Projects has been assisting Maranoa Regional Council with the planning, operation and management of Roma Airport since late 2011. In the course of this involvement, we have developed a sound understanding of the social and economic benefit that the airport provides to the Maranoa Region. · The route is not currently subsidised, but Qantas link enjoys the benefit of a monopoly on the basis of providing a minimum level of service that is being significantly exceeded in terms of the number and frequency of flights it operates. · A second carrier may provide enhanced connectivity to other destinations in its network. In summary it is recommended that the Roma – Brisbane air service route be deregulated. · The volume of flights far exceeds the 16 weekly flights that are regulated - currently there are consistently 50+ flights per week. · The Roma – Brisbane route is financially viable enough to sustain multiple aircraft operators removing a key reason that the route was originally regulated. · Deregulating the route will enable Skytrans the option to sell fares to the public for the existing 8+ flights that they are currently operating on a closed charter basis. · A second aircraft operator will also expand on the current Qantas link network, potentially adding additional destinations. · A risk in deregulating the Roma – Brisbane route is passenger numbers reduce to a point that the service provided is no longer adequate, although our current forecasts suggest this will not happen. If that situation eventuates a case can be put to DTMR to re-regulate. 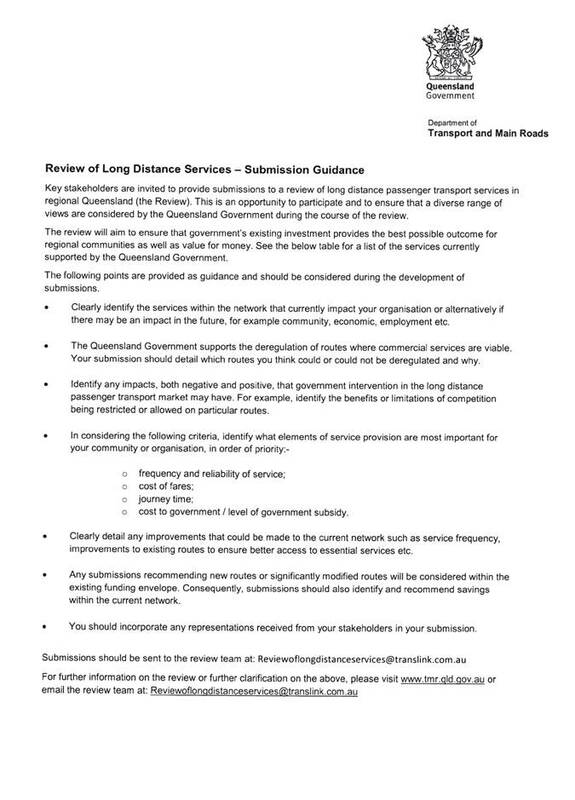 · In deregulating the Roma – Brisbane route any additional operators that wish to start an RPT service at the Roma airport would do so through a negotiation with Council. Council considered the matter at a recent workshop. Following extensive discussion, Council would like to retain the current level of service. The only addition was Councillors felt that there may be merit in considering a south to north service – e.g. from Moree to Emerald. In the light that a significant number of our visiting public travels the inland route, this may be a viable option. Councillors expressed the view that the service should be continued in its current form - it is an important service to the western towns, providing comfortable, cost effective travel. Comments were also made that freight should be a far greater focus via trains to reduce heavy vehicles from roads. This has significant potential to provide far greater use of this significant infrastructure, and would also subsidise the travel for passengers. DTMR have recently advised that there is no guarantee of funding if submitted for 2013/2014 however if Council are able to complete the works prior to 25 June 2013, funding can be provided on the signing of a deed of agreement. Council advise DTMR that the construction of the bus shelter can be completed by 25 June 2013 and Council sign a deed of agreement so the funding can be guaranteed. The matching funding to be provided by Council to be determined following the March Budget review process. Council resolution GM/01.2013/12 agreed to seek funding of 50% from DTMR and budget matching funds for the installation of a bus shelter in the 2013/2014 year. A submission was made to DTMR for funding of $15,500 for the 2013/2014 year. Councillor Denton requested Council to approach DTMR to see if there was an option to progress this earlier. On the 5 April 2013, DTMR advised that funding would be available for 2012/2013 if works could be completed by 25 June 2013. Council will be required to match funding provided by DTMR and will be responsible for the future maintenance of the bus shelter.